Looking at sub-Saharan Africa, we ask the following questions: How strong are the incentives of business owners and managers to compete, grow, and invest domestically? How does the political economy of state-business relations in Africa affect their incentives? Who are these owners and managers? How did they obtain their skills, knowledge, and management capacity as well as capital to build and grow high-productivity firms? Most African countries have been slow to converge to a high level of productivity, both across and within sectors. The figure below shows that share of employment in agriculture, manufacturing, and mining in Zambia vs. Mexico on the vertical axis and the labor productivity in these sectors on the horizontal axis. The dashed lines represent 1950, the solid lines 2005. 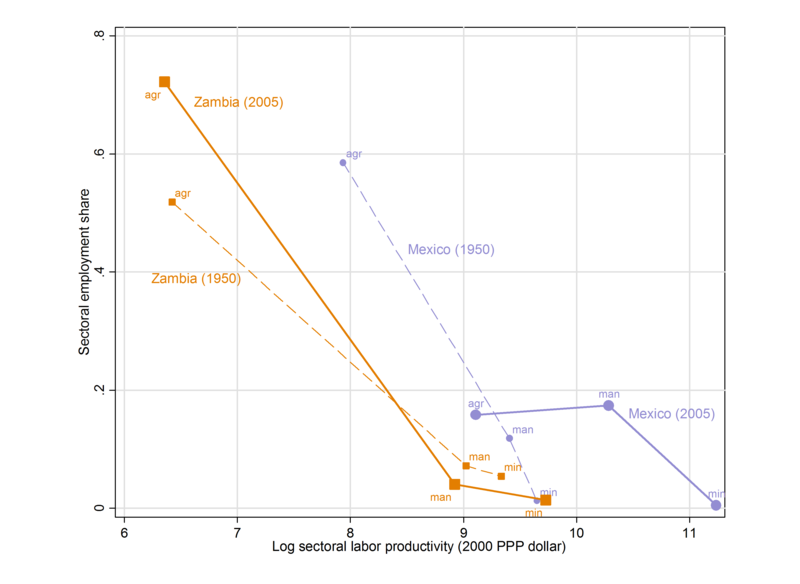 We see that while labor productivity in agriculture has increased significantly in Mexico (corresponding to a decline in employment), it has been stagnant in Zambia for over 50 years. Notes: agr = Agriculture; man = Manufacturing; min = Minerals. Source: Gelb, Meyer, Ramachandran (forthcoming, 2014), based on McMillan and Rodrik (2011). Why is this the case? Distortions caused by a poor business climate can constrain the shifting of factors between sectors and firms in ways that can delay convergence. When the business climate is very bad, an economy can be reduced to a combination of subsistence activities and a few high-productivity enclaves, such as offshore oil wells that operate within their own security and regulatory environments. In addition, the small size of most African economies has led to the formation of powerful groups, often with close relationships to governments, and with an interest in the status quo. In many African countries, skills are concentrated within ethnic minority groups or in foreign-owned subsidiaries which dominate the business sector. This may complicate state-business relations and slow the diffusion of modern business methods and technologies. No doubt there will be a lively discussion of these issues at the workshop. We are also interested to hear what the other presenters will be talking about – some 50 papers are being discussed in parallel sessions. And it will be very exciting to be in Beijing, to experience the sights and sounds of the city, and to witness firsthand the rapid economic development that has occurred in China.